Here’s my sermon from today’s Parish Mass. 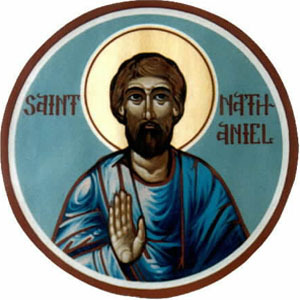 The Old Testament reading tells the story of the call of Samuel while the Gospel is the call of Nathanael. There’s nothing worse than being with a group of people and someone tells a joke – and you’re the only one that just doesn’t get it. Everyone else thinks its hilariously funny and you just don’t get the punchline. Every year during August Edinburgh holds its world famous festival, and long with the festival you will find the fringe – a range of additional shows that has grown up around the official festival. And in recent years there has been a competition, with a cash prize and voted for by those attending, for the best 10 jokes of the Edinburgh Fringe. This annual joke competition is now so popular it’s reported in all the quality press – even The Times and The Telegraph. Now, I think I’ve got a pretty normal sense of humour, but every year I just don’t see the point of half of the jokes listed. Often it takes a while before I can even see why it’s supposed to be funny. Take the winning entries from the last three years – none of which I found funny even after I had understood the point of the joke. I’m going to roadtest them on you now. 2010 – Tim Vine won for this: I’ve just been on a once-in-a-lifetime holiday. Tell you what, never again. Sometimes, of course, you get the point of a joke straight away. I rather liked the joke that came second last year, though when I tried it out on my family it took some of them a while to get the point. Tim Vine again: Crime in multistorey car parks. That’s wrong on so many levels. Sometimes you hear a joke and it just isn’t funny. And then later on, the penny drops, to coin a phrase (and did you see what I did there? I threw in a pun for you!) and suddenly you can say, ‘Ah! I get it now!’ You have a moment of illumination. Nathanael must have had a similar moment of illumination. Philip goes to him and says, ‘We’ve found the promised one – Jesus of Nazareth!’ Nathanael, knowing full well that Nazareth has a bit of a reputation, can’t see it. He simply does not ‘get it’ for there is no way that the promised Messiah could possibly come from somewhere like Nazareth. A bit like a Mancunian today being told that the Messiah was a Liverpudlian, or vice versa. Perhaps he thought Philip was having a joke. But Nathanael goes with Philip, perhaps so he can show Philip just how wrong he is, he meets Jesus, hears what Jesus has to say and then suddenly and the penny drops – he gets it! Jesus tells Nathanael that he “saw him under the fig tree”; and that this was enough for Nathanael to declare, “Teacher you are the Son of God!” What did Jesus mean when he said he saw Nathanael under the fig tree? What was it that so changed Nathanael’s point of view that he stopped being sceptical about Jesus and became a believer in Jesus as the Saviour of Israel, the Messiah. Obviously from Nathanael’s reaction, Jesus’ observation was surprising and supernatural. He wasn’t simply saying that he had noticed Nathanael under the fig tree earlier in the day, for example. The writer’s use of a fig tree in this passage is quite deliberate. The fig tree was a well-known symbol of the nation of Israel, and it was a potent symbol for the Jewish people, much in the same way as the oak tree used to be a symbol for England in the days when the wooden ships of the Navy ruled the seas. Jesus, in his meeting with Nathanael, is revealed as the saviour of Israel – he is the fulfilment of the dream that Jacob had of a ladder stretching from earth to heaven: “Very truly, I tell you, you will see heaven opened and the angels of God ascending and descending upon the Son of Man”. Jesus bridges the gap between the earthly and the heavenly Israel. The same thing happened to the young Samuel. In the middle of the night Samuel hears God calling him by name. He’s asleep in the Temple. Now I’ve always felt rather sorry for young Samuel, having to sleep in church. He has no idea what’s going on, so twice he responds to his teacher Eli who finally realises that it is God who is calling the young boy. Then, following Eli’s instructions, the third time Samuel responds with a child-like trust and obedience to God’s call. This time, he ‘gets it!’ Samuel’s ordinary life – like Nathanael’s – was suddenly transformed. He could no longer view anything in an ordinary way. He’d been enlightened. This enlightenment is possible for everyone. The message of the Epiphany season is that the light of Christ is given to the whole world, not just to a chosen few. As the reading of Revelation makes clear, the Lamb is sacrificed to redeem the whole world. The Light of Christ – the enlightenment of Christ – is available because Jesus Christ has come in the flesh. Because God’s eternal light shines through the person of Jesus of Nazareth, we can see God’s light and power in all things. God wants to enlighten each one of us. He wants us to see the world, to see life, in a new way. In other words, he wants us to see him in all his works. “The heavens declare the glory of God and the firmament shows his handiwork,” says the psalmist. So God wants us to wake up and be aware of his power and love working through the whole of creation at every moment. He also wants us to see his Son Jesus Christ in every person we meet. Christ is there especially in the face of those who are poor, those who are victims of war, those who are hungry, homeless, disabled. Most of all God wants us to have this inner enlightenment so that we can recognise and give thanks for his work in the world. If we allow him to open our eyes and hearts we can see through the meaningless pattern of our existence to see in a new way his love and power. For God wants us to ‘get it!’ Like the punchline of a joke, God wants us to ‘get it’ – to understand what it’s all about. Like Samuel, like Nathanael, God wants the penny to drop for each and every one of us, so that we truly understand why the Lamb of God was sacrificed and why he makes a difference and – like Samuel and Nathanael to act upon that difference. God wants us to get the point, so that like Nathanael we open ourselves to receive the light of Christ and allow our lives to be changed as a result. That’s why we look for enlightenment here as we gather around the Lord’s table to commemorate Christ’s eternal sacrifice for as he was lifted up on the cross. For as we share in the communion of our Lord earth is united with heaven. The promise of Jesus that Nathanael would see greater things comes true here at this table – heaven is opened and the power of heaven is released to come down to bless, forgive and redeem this world. Jesus descends to earth to be with us, and we ascend to heaven to be with him and all the faithful. Lord, open our ears and help us listen so that, like Samuel, you may speak to us. Open our eyes and help us to see so that, like Nathanael, we may see you do ever greater things. And open our lips, so that we may proclaim your presence to all around us.